I sent out a question to my Facebook and Twitter page recently. It's a big question, so I thought I'd share it with you too. For a change of pace, this post is a question to you, my amazing readers. As I've probably mentioned before, I'm a big fan of the book Getting Things Done by David Allen. I've read the book and listened to the audiobook more times than I'd care to admit. For some reason, I've always had a hard time putting together a good, simple system as a bookkeeper. I have several clients, and each client can have several active "projects". Each of those projects usually has quiet a few next actions. With this workflow, I can track things is several ways. I could make each client a project, and each of their projects a sub-project of sorts. Or, just track each project, and use tags to identify the appropriate client. To top it off, I run a Win 7 laptop (I know...I still haven't upgraded), an iPad, and an iPhone. Syncing between all of these is very important. I fear I haven't given some of them enough time to truly rule them out. The problem is...I can't find a lot of information out there about what other bookkeepers/accountants use. 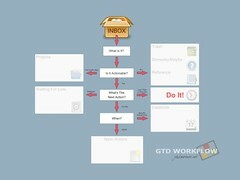 I Googled GTD for bookkeepers, and the first link that was actually about a bookkeeper using GTD was a really old post of mine. If I was 100% Mac, I know OmniFocus is very powerful, albeit expensive. I don't know of a Windows desktop app that also syncs with iOS. Anyway, I was hoping to get some feedback from you. You don't have to be in my field. You can leave a comment, or contact me if that's better for you. Let me know what software you use, overall workflow tips, and if good ol' fashioned paper/pen still plays an important role. Thanks. I look forward to hearing your thoughts.